On January 9, 2009, a staff writer for the Wall Street Journal wrote a smear piece entitled, “Bush On Jobs: The Worst Track Record On Record,” in which an attempt was made to show that Bush was somehow the worst President, and that therefore, Conservative economic policies (i.e. tax cuts) don’t work. Naturally it is important to use this same benchmark to measure how Barack H. Obama stacks up against his predecessors. So I went over to the good old Bureau of Labor Statistics website and made up my own table, based on the raw data. I brought my chart up to date through May 31, 2010. True, Obama has only been in office for 17 month’s, but we can at least get an idea of how he measures up. Like the WSJ writer, the counts are based on total payrolls between the start of the month the president took office (using the final payroll count for the end of the prior December) and his final December in office (May 31, 2010 for Obama). Thus, there is no blaming the last POTUS for inheriting a bad economy, and no foul in taking credit for inheriting a good one. After all, being President is about leadership, and leaders take what is in front of them and do the best they can. According to my table, Barack Obama has lost a total of -4.2 million jobs per year, making him, to date, the worst President in history. G.W. 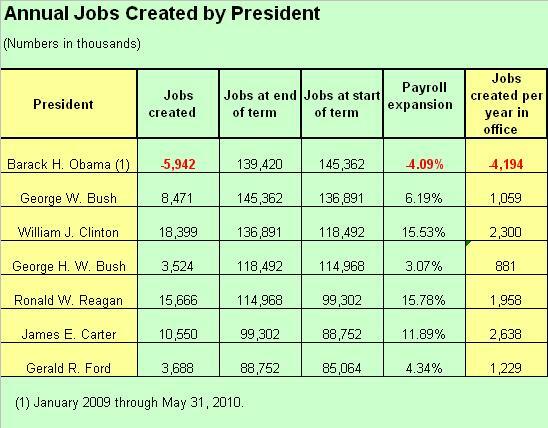 Bush actually created 1.1 million jobs per year during his eight-year term. Bill Clinton is responsible for 2.3 million jobs in each of his years. George H. W. Bush can lay claim to 881,000 during each of his four years. Reagan gets credit for 2.0 million jobs per year. And finally, even Jimmy Carter can boast in having created 2.6 million jobs per year. Net job creation is so much better than, economy killing, Progressive policies that there really is no comparison. Now I am not naïve enough to believe that Presidents, or that governments for that matter, are responsible for job creation, but if you want to make that case, at least get the numbers right. It looks like the WSJ staffer padded Clinton’s numbers while taking away from both of the Bush’s. At the same time, he did manage to get both Reagan’s and Carter’s numbers right. In conclusion, thus far, the Progressive policies of Barack H. Obama are failing. There ought to be a law. Actually there is a law. It’s called, ‘The Law of Supply and Demand’. When prices fall, demand increases. When taxes are reduced, investment, production and employment increase. And when supply is increased, prices fall, leading to increased demand. Government intervention in the private sector has never worked, and it never will. Reducing the size of government, lowering taxes, and decreasing government regulation actually work after all. We will most definitely be following up. Data was taken from Table A, Household Data, which has been revised multiple times since. See my post entitled, “Final: Tracking the 5.19 Million Jobs Obama Squandered” for the final result of Obama's Stimulus plan.